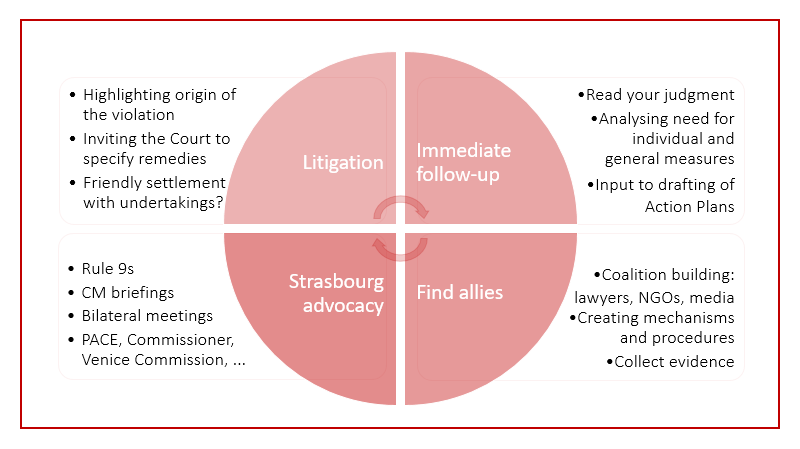 What role for lawyers in promoting the implementation of Strasbourg Court judgments? On 17 March, the EIN was in Zagreb, Croatia, to hold a one-day thematic training seminar for criminal defence lawyers and representatives of NGOs who litigate cases related to fair trials. The event, which was organised with the support of EIN’s member Fair Trials, brought together more than a dozen members of Fair Trial’s Legal Experts Advisory Panel (LEAP) network of experts in criminal justice and human rights from different countries, with the aim of equipping them to better follow up on the cases they won at the European Court of Human Rights (ECtHR, ‘the Court’). The trip to Zagreb also provided an opportunity for EIN Chair Başak Çalı and EIN Co-Director Anne-Katrin Speck to hold a meeting with one of the Network’s newest members, the Human Rights House Zagreb. We had a useful exchange about how to enhance, in a sustainable fashion, Croatian civil society’s capacity to use the Strasbourg process to promote urgently needed reforms in their country, which has 45 leading cases pending before the CM. Başak Çalı kicked off the training seminar by stressing that a case won in Strasbourg was no reason, by itself, to open the champagne quite yet. True success only comes with full implementation of the ECtHR’s judgment. Since there can be disagreements about when that point has been reached, it is vital for lawyers and NGOs with knowledge from the ground to counter any unduly positive accounts by the government about the status of implementation. That way, they can help avoid the Committee of Ministers (CM), which supervises the execution of the ECtHR’s judgments, closing a case prematurely. The seminar highlighted lawyers’ responsibility to make sure their clients are adequately redressed for the Convention violations they suffered, and inform the Committee of Ministers of any failure on the part of the state to take the relevant (monetary or non-monetary) individual measures required to execute the Court’s judgment. What is more, litigating lawyers will often be aware of the status of implementation of so-called ‘general measures’, and notably any prevailing inconsistencies of national courts’ jurisprudence with Convention standards and the ECtHR’s case law. A representative of the Department for the Execution of Judgments of the European Court of Human Rights (DEJ) of the Council of Europe stressed that the Department needed NGO and lawyers’ input from the ground to understand the domestic environment in which a judgment is landing, and invited them to tell the DEJ what has changed domestically since the violation occurred. EIN’s training seminar participants learned how lawyers, who are not entitled under the Rules of the Committee of Ministers to comment on general measures, can partner with NGOs to submit such contextual information to the CM in the form of a Rule 9.2 submission. A huge thank you goes to Maria Radziejowska and Katarzyna Wiśniewska, who offered inspirational suggestions on how the human rights commissions of national bar associations and NGOs can systematically collect evidence from lawyers, and bring this data to the CM’s attention. The participants also heard from the EIN secretariat about how they can make sure their Rule 9 submissions have the greatest possible impact. One key take-away from the seminar was that submissions to the CM are not a panacea, but only one tool in a widerarsenal that lawyers and NGOs can use to advocate for the full and rapid implementation of the cases they are supporting. Importantly, reflecting on implementation should start way before the ECtHR hands down its judgment. Lawyers should clearly spell out the origin of any violation they allege in their applications to the Court, and consider inviting it to call for specific remedial measures. Domestically, they should seek, as far as possible and in coordination with other actors, to engage with the authorities with a view to influencing the drafting of Action Plans. This way, Rule 9 submissions can become embedded in a holistic advocacy strategy, spanning the entire ‘lifetime’ of a case. EIN is excited to see participants return to their countries and implement the lessons learned in their daily work. One participant undertook to donate his pro bono hours to working on implementation, and to encourage his colleagues to do the same. Another has already carried out an analysis of all fair trials related cases pending before the CM against his country, and is exploring ways to engage the human rights commission of his national bar association, of which he is a vice-president, to collect evidence on the implementation of these rulings. Opportunities for lawyers to engage in implementation are manifold, and we look forward to more Rule 9 submissions from our training participants. If you are a lawyer or NGO representative, and want to see more tips shared with the participants of EIN’s training about how you can effectively advocate for the implementation of your cases, read-up on our live tweeting from Zagreb on Twitter, under the hashtag #EINtrainingFairTrials. EIN would like to extend a warm thanks to Fair Trials, who have been a great partner in organising this training seminar, and to Geanina Munteanu from the DEJ for sharing an insider’s view on the CM judgment execution process and avenues for lawyers and NGOs to engage with it.